A few years ago, noise-canceling earbuds were a bit of a boring subject. Noise-canceling technology was only truly effective for over-ear and on-ear headphones. Not anymore. As noise-canceling technology evolves, earbuds are getting more advanced and, in some cases, catching up with their bigger over-ear cousins. In this article, we take a look at the 10 best noise-canceling earbuds of 2019 and let me tell you, there are some really exciting products in this list, some of which you probably didn’t know existed. 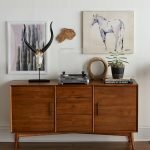 Be sure to check out our buyer’s guide at the end of this article where we help narrow down your choice based on your requirements. The Bose exclusive TriPort technology and Active EQ helps deliver a lifelike and digital-quality audio. There are two types of noise canceling technologies – Passive and active noise-canceling. When it comes to earbuds, especially the cheaper models, passive noise-canceling is the most commonly used by manufacturers. Uses the physical design of the product and the fit inside the ear to isolate your ears from the surrounding environment. In essence, this is more noise isolation as opposed to noise-canceling. Requires the use of a power source to employ an electronic noise-canceling filter. On each earbud is an ambient microphone (or multiple microphones on more sophisticated models) which picks up the noise around you can then cancels the audio frequency. Many people believe that noise-canceling headphones eliminate all the sound around you where in fact they’re really only effective with low-frequencies. This is why they’re so popular on planes because noise-canceling earbuds remove the noise made by the airplane’s engines. 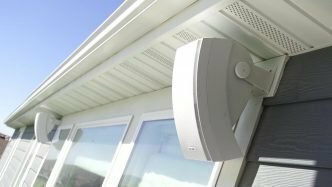 High frequencies can still be heard, but just not as loud. In premium noise-canceling earbuds, high-frequencies are muted a lot better but can still be heard if you listen without any audio. When it comes to noise-canceling earbuds or headphones, Bose always seems to find it’s way near the top of the list. Bose have invested a lot of money in research and development to become the leader in the noise-canceling headphone niche and, so far, they seem to be succeeding. The QuietComfort 20 (QC 20) Acoustic Noise Cancelling Headphones is one of the few earbuds with active noise-canceling technology. And certainly one of the best noise-canceling earbuds in the consumer end of the market. The QuietComfort 20 has an exceptionally good active noise-canceling technology. For travel, there are few earbuds which can match the QuietComfort 20 when it comes to the noise-canceling attenuation which appears to be as much as 25-30dB. You’ll literally be isolated in your own little world. For travel, this is especially great because you can listen to audio at lower levels, reducing any long-term damage to your ears. The QuietComfort 20 is available for Android (QuietComfort 20) and iPhone (QuietComfort 20i). The headphones are identical with the only difference being the remote control is calibrated to work with Android and iOS operating systems. The QC 20 remote features a single multi-function button, volume control, and Aware Mode switch. The multi-function button operates many facets of the QC 20, more than I’m going to list here. Without listing every function in detail, the multi-function button enables you to play/pause/skip tracks, manage calls and activate voice prompts (Siri/Google). The Aware Mode button engages and disengages the QC 20 ambient microphone. The ambient microphone picks up sound around you so you can have a conversation or listen to an announcement without removing the QC 20 earbuds. This is a feature often found on high-end over-ear noise canceling headphones and very rarely found on consumer noise-canceling earbuds. Further down on the QuietComfort 20 cable, near the ⅛-inch connector, is the earbud’s battery pack. Because the QC 20 is an active noise-canceling earbud, it requires a battery pack. Having the battery far down the cable means you can put it in your pocket or bag with your smartphone or MP3 device. This is especially useful when traveling or on the move. When fully charged, the QC 20 battery will last up to 16 hours. More than enough for most long-haul flights. The 16-hour battery will fully recharge in around 2 hours which is great for recharging during layovers. 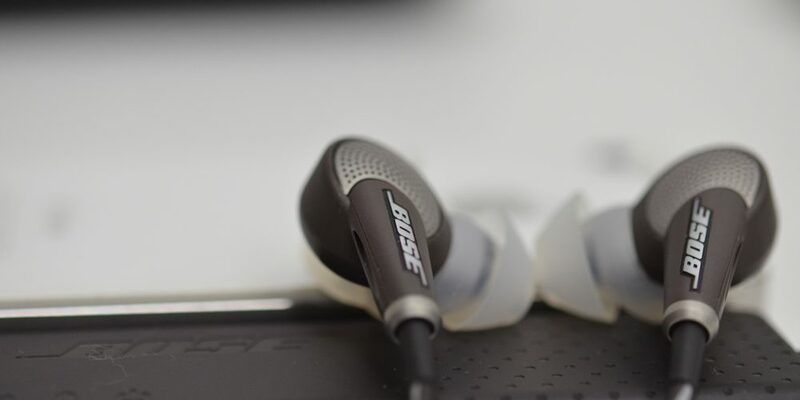 Bose have essentially optimized the QC 20 to be the best noise-canceling earbuds for travel. As the QC 20 is a travel earbud, I’m a little disappointed Bose didn’t include an in-flight adapter. However, these adapters can be purchased for very little online so it’s not a big issue. Included with your QC 20 earbuds are three sizes of Bose StayHear+ ear tips, small, medium and large. The StayHear+ tips are soft ear tips which fit comfortably to the contour of your ears for a snug, isolating fit. Unfortunately, you can’t use generic ear tips for the QC 20 so you’ll have to purchase Bose StayHear+ tips when you’re in need of replacements. These are really comfortable so I doubt you’ll find this to be an issue. While the QuietComfort 20 is great for travel and general listening, it’s not a great noise-canceling earbud for travel. The QuietComfort 20 has no protection against sweat or moisture while the battery pack makes the cable bulky and difficult to stow. For all other applications, the QC 20 is the best noise-canceling earbud. For travel or working in a busy environment, the QC 20 will allow you to shut out the world and live in your own little quiet bubble. The SENSO Activbuds S-250 is one of the most popular headphones on Amazon with close on 30,000 reviews, 76% of which are 4 & 5-star reviews. Not many headphones, or any electronics product for that matter, has this many positive reviews. With sound being so subjective, this says a lot about the SENSO Activbuds S-250 noise-canceling headset. It’s important to note the Activbuds S-250 is a passive noise-canceling earbud. With that said, the Activbuds S-250 significantly reduces a lot of surrounding extraneous noise which is perfect for a noisy workout environment such as a gym. The Activbuds S-250 was designed specifically as a gym or workout headphone. The headset is fully wireless connecting to your MP3 player or smartphone via Bluetooth 4.1. The earbuds are connected via a short cable which sits out of the way behind the neck. SENSO includes a cable tie to wrap up any additional leftover slack right up against the back of the head if necessary. This allows you to workout unimpeded by any headphone cable. Additionally, the Activbuds S-250 carry an IPX-7 waterproof rating which means they can be submerged to a depth of 1m for up to 30 minutes. Perfect to protect against sweat from your workout and even rinsing the Activbuds S-250 after. The Activbuds S-250 ear tips fit comfortably inside the ear canal with hooks over the ear for a secure fit. This secure fit serves two purposes, one it allows you to work out vigorously without worrying about the earbuds falling out and two, assists with maximizing the Activbuds S-250 noise-isolation capability. On the right ear of the Activbuds S-250 is a multi-function button with volume up and down. Below the volume buttons is the Activbuds S-250 built-in microphone for making and receiving calls. The easy to reach multi-function button works for power on/off, call management, Bluetooth pairing, and play/pause. The volume buttons also double as track skip forward and backward. The Activbuds S-250 battery lasts up to 8 hours of continuous use and 240 hours in standby mode. This is more than enough for a full week of training 1 hour a day. The battery fully recharges from flat in less than 1.5 hours which is great if you’re traveling and have only a little bit of time during a layover. 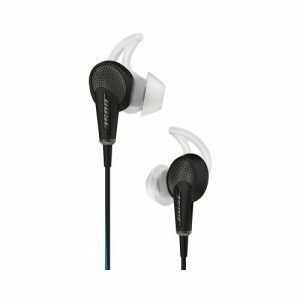 The Activbuds S-250 comes with three memory foam ear tips, small, medium and large. These are a generic fit so you can use the ear tip brand of your choice. Also included is a carry pouch and soft shell carry case. The pouch is useful for traveling as you can just stuff the Activbuds S-250 in the pouch and then in your pocket protect the earbuds from picking up any dirt or sediment from your pockets or bag. 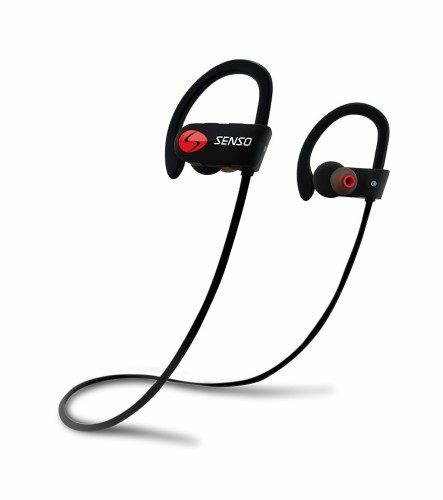 If you’re looking for noise-canceling earbuds for working out, then the SENSO Activbuds S-250 Bluetooth Headphones is going to be the best option. While the Activbuds S-250 don’t deliver audiophile quality audio, it is good enough for listening to music while you work out. You also get passive noise cancellation, a built-in microphone for taking calls and controls for your Bluetooth device. At under $30, the Activbuds S-250 offers exceptional value at an affordable price. The Mpow Jaws is essentially a cheaper version of the Sony WI1000X/B noise-canceling headphones. Where the Sony noise-canceling earbuds cost almost $200, the Mpow comes in at under $20. Is there as big a difference between the two products as there is in price? The answer to that is yes and no. The Mpow Jaws is a unique earbud design in that it features a neckband attached to two separate earbuds via a cable. When not in use, the earbuds magnetically lock neatly onto the headband. This keeps the earbuds from dangling loosely around your neck and also makes them easier to transport. The primary purpose of the neckband is to house the battery which powers the active noise cancellation. At least this is true for the Sony WI1000X/B. The Mpow Jaws features CVC 6.0 noise-canceling which is essentially a noise reducing technology rather than noise-canceling. This puts the Jaws somewhere between noise canceling and noise isolating. Still, the result is good, blocking out a significant amount of the surrounding environment. When making and receiving calls, the CVC 6.0 noise-canceling adds noise suppression allow both you and the caller to experience excellent call quality. Perfect for taking a call in a noisy public area, the office or while traveling. While the neckband is extremely lightweight, it does limit the Mpow Jaws from being a workout headphone. The neckband sits loosely around the neck which means it bounces around when running, jumping or moving around vigorously which can be annoying while working out. For travel, walking or sitting at a desk, the neckband is virtually unnoticeable. The Jaws earbuds feature standard generic ear tips which fit deep inside the ear canal offering additional noise isolation. The fit is comfortable and the earbuds are so small and light you barely notice they’re there. On either end of the neckband, below the chin, are various buttons. The volume control is on the right-hand side, with the power button below it. On the left is track skip forward and back and multi-function button. The multi-function button is used for play/pause, Bluetooth pairing and call management. The Jaws features a 13-hour built-in battery with 350-hours of standby time. From flat, the battery will fully recharge in around 3 hours. This is more than sufficient for traveling and wearing around the office without needing to charge for a full day use. If you’re looking for an affordable noise-canceling earbud for travel or to wear around the office, then the Mpow Jaws is a good budget option. 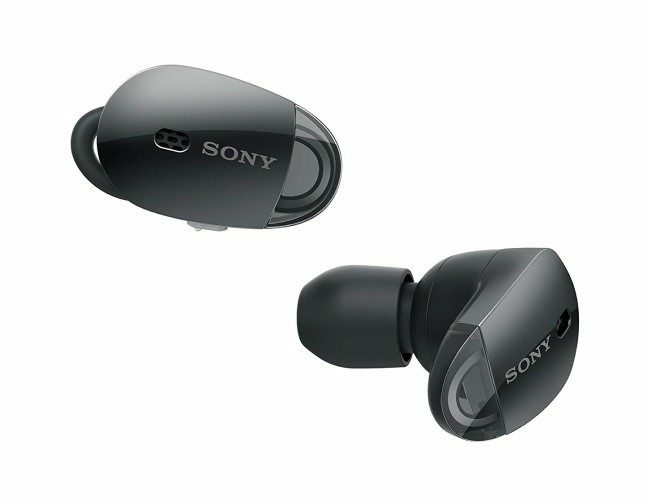 While the Jaws does not deliver the exceptional audio quality of it’s more expensive Sony counterpart, it does come in at one-tenth the price. Having said that, for the average consumer making calls and listening to music, the Jaws works just fine. 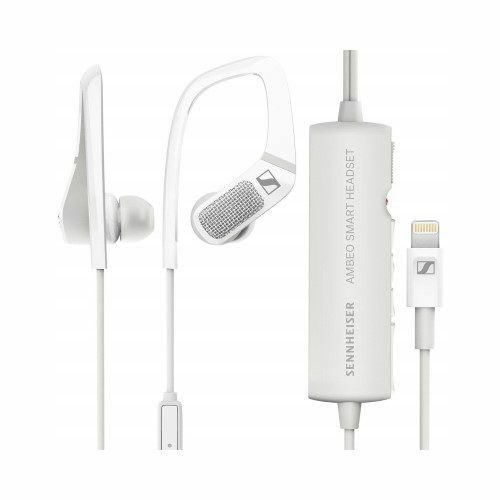 In each earbud, Sennheiser has installed microphones so you can hear and record your surrounding environment. The recording, as well as what you hear live, will be a 360° audio experience. So, if a bird is chirping in the tree to your right, a dog barks behind you and someone is talking off to your left, your audio recording and what you hear live through the headphones will depict this. his type of audio recording will transform your video and audio recordings to an exciting immersive experience. This is especially great for content creators making YouTube or even Instagram videos. Just connect the AMBEO to your iOS smart device through the Lightning Connector and begin recording using the standard Apple video or audio app. But what about the earbuds for general use? The AMBEO feature active noise canceling technology which is far superior to most noise-canceling earbuds on the market. As a travel headphone, the AMBEO is great. You can completely shut off the world around you with active noise-canceling but then easily switch the microphones on to have a normal conversation. As the microphones pick up a significant amount of detail, you could even eavesdrop on a conversation nearby far better than just using your ears. Good news if you’re the nosy type. The AMBEO features an inline remote which allows you to switch between the binaural microphones and engage noise-canceling. For ‘normal’ features, the remote also lets you play/pause, skip tracks and adjust the volume. There is also a power switch to turn the headphones on and off. The AMBEO connects to your iOS device via the Apple Lightning Connector which means no battery is needed to power the earbuds. A major plus for a noise-canceling earbud. When it comes to actual audio quality, the AMBEO is excellent. The headphones produce a nice chunky bass response with mids and highs crisp and clear. For some bass-heavy music, the bass does get a little overpowering which somewhat interferes with the midrange clarity. 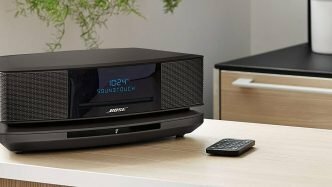 In terms of overall sound quality for music and audio, the AMBEO produce more bass than the Bose QuietComfort 20 but the latter has better overall audio quality. Lastly, the Sennheiser AMBEO comes with an impressive app which allows you to control just about every aspect of your headphones. The app is actually functional allowing you to adjust EQ, microphone settings, noise-canceling and more. Although the Sennheiser AMBEO is cool and unique, it might not be the right noise-canceling earbud for everyone. 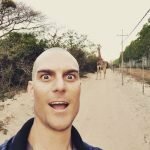 If you’re a YouTuber or content creator, then the AMBEO is a must. These earbuds will transform your videos allowing you to create an immersive visual and audio experience for those watching. Even if you just like recording video for your Instagram stories, the AMBEO will up your Insta game considerably. If you’re looking for a high-quality noise-canceling earbud without the fancy stuff the AMBEO has to offer, then you’re probably better off going with either the premium Bose or Shure options we recommend in this article. Alternatively, if you’re a content creator looking for a professional 3D microphone, the AMBEO is modeled off the Sennheiser Ambeo VR 3D Microphone. Attaching this microphone to your camera will enable you to record high-quality binaural audio. SGNL is a relatively new company with a focus on making trendy tech products. They have had a couple of products funded on Kickstart (the HB-N50 was not one of these) with the SGNL HB-N50 being featured on Fox Digital. The SGNL HB-N50 is a wireless noise-canceling pair of earbuds. The earbuds connect via a short cable which wraps around the back of the neck. This short cable makes the HB-N50 versatile enough for general listening and workouts keeping any excess out of the way behind your head. The HB-N50 is IPX4 waterproof rated which protects the earbuds from water sprayed from all directions. Basically, the HB-N50 is splashproof which is perfect to protect against sweat from working out. The HB-N50 features active noise canceling which eliminates a significant amount of background noise. While the HB-N50 isn’t quite as good as the Bose QC 20 when it comes to noise-canceling, it’s not far off and without doing an A/B comparison between the two, you might even think they’re the same. Seeing as though the HB-N50 is more than $100 cheaper than the QC 20, this is impressive from a boutique unknown brand like SGNL. As well as noise canceling, the HB-N50 features what SGNL calls “Open Ear Control” which allows you to engage noise canceling while also turning on the built-in ambient microphones. 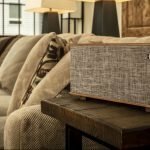 This is useful if you want to listen to your music in relative quiet while still keeping an ear open to what’s going on around you. For instance, cycling on a busy road while listening to music on your headphones, you still want to be able to hear cars, hooters or dangers around you. When it comes to audio quality, the HB-N50 is as good as some premium noise-canceling earbuds on the market. The HB-N50 produces a nice chunky bass with clear mids and highs. While not audiophile quality, certainly good enough with excellent clarity for the average consumer. The bass response makes the HB-N50 listening to urban and dance music especially exciting. Other than the cable connecting each earbud, the HB-N50 is completely wireless connecting to your device via Bluetooth 4.1. On the cable below the right ear is an inline remote. The HB-N50 remote gives you a significant amount of control over your Bluetooth device. There is a 3-button set of controls for play/pause, track skip, volume control, and call management. On the opposite side to the 3 buttons is your power/Bluetooth button and micro USB charging input. Lastly, there is a single button for switching between noise-canceling, Open Ear Control or normal modes. The HB-N50 has a built-in battery with 13-hour battery life. From flat, the HB-N50 will fully recharge in around 2 hours. If you’re looking for a premium quality noise-canceling earbud at an affordable price, then the SGNL HB-N50 is definitely one to check out. The HB-N50 is great versatile noise-canceling earbud for traveling, working out or just general listening. The built-in microphone means you can also take calls on the go which is great for corporate consumers. At under $140, the HB-N50 is one of the most affordable active noise canceling earbuds on the market while still offering premium audio quality and aesthetics. What would a headphone best list without a product from Sony? Probably still a headphone best list. 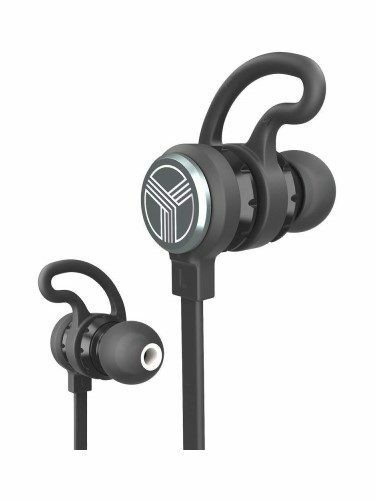 The WF-1000X is a pair of wireless noise-canceling earbuds specifically designed for sports and workouts. The WF-1000X carries an IPX4 waterproof rating which will protect against splashes of water and sweat. Perfect for vigorous sweat-inducing workouts. When you first encounter the WF-1000X earbuds you’ll notice two things. These earbuds are small and 100% wireless. Each earbud fits snug inside the ear maximizing comfort and noise isolation. Small fins on each WF-1000X keep them in place making it possible to run, jump, cycle or other workout activity without worrying about the earbuds falling out. On each earbud is a single multi-function button for controlling both your WF-1000X earbuds and paired Bluetooth device. The left ear button pairs Bluetooth and activates noise-canceling/Ambient Sound Mode. The right ear operates music functions (play/pause/skip), manages calls, and activates voice assist (Google/Siri). All these controls can also be managed via the Sony iOS/Android app. Volume control can only be operated from your audio player or the Sony app. The WF-1000X comes with a rechargeable carry case which can keep your earbuds charged for 9-hours of use. The earbuds themselves will only last up to 3 hours before they must be returned to the case for charging which takes up to 90 minutes. While this is fine for workouts and short commutes, you may not want to consider the WF-1000X for travel, especially long-haul flights. The WF-1000X features an active noise cancellation technology which is good but not as good as the Bose, Sennheiser or even SGNL noise-canceling earbuds. I’d rate the WF-1000X at about 20% less than these other models when it comes to noise-canceling. One thing to keep in mind is that these other brands are built for travel while the WF-1000X is designed more for sports. 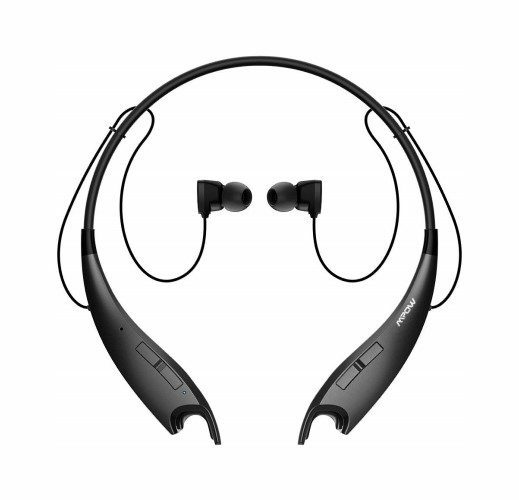 With that considered, the noise-canceling in the WF-1000X is great for working out and noisy gym environments. The WF-1000X also comes with Sony’s Ambient Sound Mode which allows you to switch on ambient microphones to hear your surrounding environment. A great feature for runners and cyclists in busy suburban areas wanting to listen to music while still staying alert to what’s going on around you. If you’re looking for a pair of noise-canceling earbuds for workouts and training, then the WF-1000X will be an excellent choice. The WF-1000X is also great for walking around the city and short public transport/taxi commutes. For both workouts and short commutes, the Ambient Sound Mode allows you to listen to your audio while still staying aware of what’s going on around you. Alternatively, for a fully immersive training session, you’re able to completely shut out the outside work to focus on your workout. For any activity where you need to use noise-canceling earbuds for more than 2-3 hours, you will find the WF-1000X limiting due to the short battery life. Audio-Technica manufacture some of the best over-ear headphones on the market. 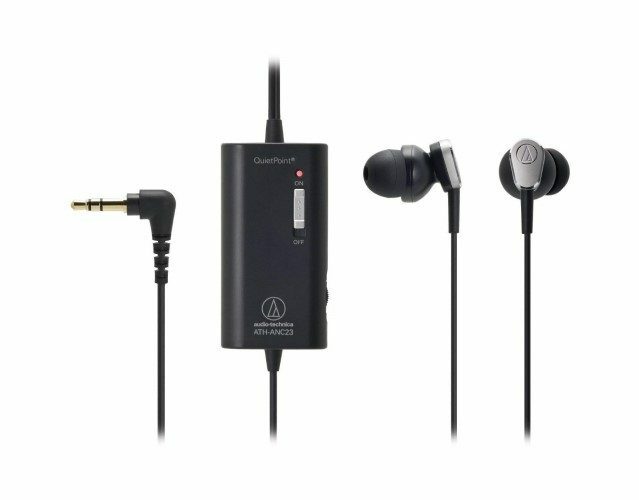 What many don’t know is Audio-Technica also have a range of in-ear or earbud headphones. The ATH-ANC23 is an in-ear headphone featuring Audio-Technica QuietPoint noise-canceling technology which claims to block out 90% of extraneous noise around you. The ATH-ANC23 is a simple earbud headphone designed primarily for travel and general listening applications like working at a desk or listening to music in noisy environments. The earbuds only focus on noise-canceling leaving out microphones for hands-free calling, Bluetooth controls, and other distractions. The does two jobs really well, plays music and the ability to turn noise-canceling on or off. If you’re looking for a simple noise-canceling earbud headphone, the ATH-ANC23 is it. The active noise-canceling on the ATH-ANC23 works really well. You can have this either on or off with no difference in audio quality whether noise-canceling is engaged or not. The ATH-ANC23 is a cable only headphone which means no Bluetooth. On the cable is the battery operated noise canceling device which takes a single AAA battery. That’s right, no built-in rechargeable battery for the ATH-ANC23. My first impression was to scoff at this, but a single AAA battery gives you 60 hours of noise-cancellation. This is a little more than 3 times that of the Bose QC 20 16-hour battery life. Purchasing AAA batteries can be expensive but you can buy rechargeable batteries instead to save money. Expect to get a little less battery life from a rechargeable battery compared to regular batteries. Even if you just get 50% battery life from the AAA rechargeable, it’s still almost double the QC 20. Essentially, your ATH-ANC23 battery will last as long as the number of AAA batteries you choose to carry. So definitely a big plus rather than a negative. The ATH-ANC23 comes with Audio-Technica Comply™ Foam tips which offer superior comfort and aid in maximizing noise isolation. Audio-Technica has been kind enough to also include a 2-pin in-flight adapter making these the ultimate noise-canceling travel earbuds. If you’re looking for a pair of noise-canceling earbuds without all the additional features like hands-free calling, audio controls, etc, then the Audio-Technica ATH-ANC23 is the one for you. The noise-canceling is excellent and you get an in-flight adapter making these earbuds perfect for travel. The super comfortable one size fits all Comply™ Foam Tips ear-tips are some of the most comfortable on the market with three additional silicone ear tips also included. 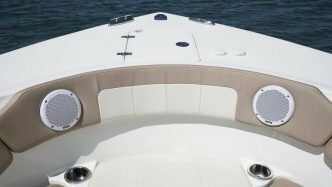 The best part about the ATH-ANC23 is the price. For under $40 you can own a premium pair of noise-canceling earbuds which is unbelievable value. The TREBLAB J1 are passive noise canceling earbuds featuring the CVC 6.0 noise-canceling technology. The J1 is one the budget end of the noise-canceling earbud price range coming in at under $40. TREBLAB has designed the J1 specifically for those looking to workout while listening to music. Even though the J1 is a budget earbud, it still comes with some premium features including an IPX6 waterproof rating to protect against water sprays and sweat. 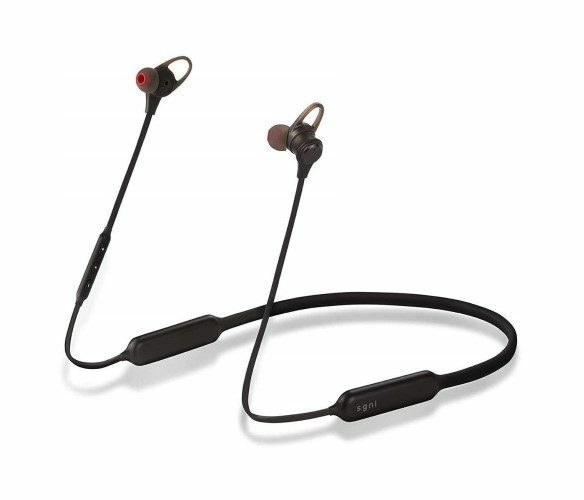 The J1 follows a similar design to the SGNL HB-N50 and SENSO Activbuds S-250 which are wireless earbuds connected by a cable behind the neck. The J1 is made of brushed aluminum earbuds rather than the plastic HB-N50 and Activbuds S-250. The ends of the J1 earbuds feature the TREBLAB logo which is, in fact, a magnet. This allows you to connect the J1 earbuds together around your neck keeping them in place, especially useful when working out or on the move. The J1 also comes with more accessories and ear tip options than the more expensive HB-N50 and Activbuds S-250. With the J1 you get 3 x silicone and 3 x memory foam ear tips in small, medium and large. You also get three fins which help keep the earbuds in place for workouts. In addition, you get a clip to wrap up excess cable behind the neck and a hard shell carry case to keep the earbuds, charging cable and accessories. The J1 features an inline remote which allows you to control your paired Bluetooth device. There are three buttons, volume up, volume down and play/pause, all of these feature multi-functionality. The play/pause button is also used for powering on/off, Bluetooth pairing, and call management while the volume controls allow also enable you to skip tracks forward and backward. The built-in battery lasts up to 8 hours of continuous playing and recharges within 2 hours from being completely flat. This is acceptable for both travel and working out. One of the most impressive features on the J1 is the built-in microphone for hands-free calling. Call quality is exceptional and if you didn’t tell the caller on the other end you were on a hands-free device, they wouldn’t even know. This brings us to overall audio quality. When it comes to budget headphones, often this is where they struggle a bit, not with the TREBLAB J1. These earbuds sound really good. The only disappointment is a slight lack of bass, however, if you’re not a bass head, this won’t be an issue for you. Mids and highs are present and clear with everything from music to dialogue coming through clearly on the J1. Very impressive for budget noise-canceling earbuds. If you’re looking for a budget pair of noise-canceling earbuds, then you definitely want to check out the impressive TREBLAB J1 earbuds. Even though these are budget earbuds, the J1 perform well in every feature. Great build quality, good sound quality, hands-free calling that actually works, IPX6 waterproof rating and most important CVC 6.0 noise-canceling technology. At under $40, you won’t be disappointed with your TREBLAB J1 purchase. 9. Shure SE846-CL Sound Isolating Earphones. When it comes to professional in-ear monitoring, Shure is the undisputed industry leader. Shure makes some of the best in-ear monitoring systems with the SE846-CL Sound Isolating Earphones being their flagship model. These are not your average earbuds, these are the type of headphones you see professional artists using on stage. The sound quality is on another level which most people will never know about or experience. Not just because the SE846-CL is an expensive earbud headphone, but because Shure doesn’t market these to the general consumer. Walk into a music store or ask a musician which are the best earbud headphones, and the majority will answer Shure, for sure. The SE846-CL has a 15Hz to 20kHz frequency response which for normal headphones means very little. However, the SE846-CL actually produces this entire frequency range with exceptional balance across the frequency spectrum. The SE846-CL has a built-in miniature subwoofer on each earbud which enables the headphone to produce sub-bass frequencies. The result is a true sub-bass response opposed to the bass boosted wooly sound you get from Beats and Sony bass boosted headphones. Like the bass, the midrange and high-frequency response are accurate and clear. The soundstage and separation is something you will never have experienced from any other earbud on the market. The SE846-CL produces perfect sound reproduction that would even make an audiophile’s jaw drop. It’s that good. Shure also includes three filters with the SE846-CL. These filters enable you to adjust the audio profile. You have the option of a flat response, warm response (bass boost) or bright response (treble boost). These filters are primarily to help an artist adjust the SE846-CL to suit the surrounding environment but can be used to tune the sound you prefer for general music playback. Also included are three types of ear tips or sleeves as Shure calls them. There is a tapered and flat top memory foam sleeve, tapered soft flex sleeve, and tree sleeves. These sleeves twist on an off to ensure they don’t come off accidentally. The cable is also rigid at the end allowing you to hook the SE846-CL over your ears for a secure fit. The SE846-CL is designed to stay in place with an artist jumping around the stage so will definitely be good enough for working out, running or just simply traveling. Shure even includes a 2-pin in-flight adapter so you can use the SE846-CL when traveling. While the SE846-CL isn’t an active noise-canceling earbud, they are designed to block up to 37dB of sound around you. This is passive attenuation is better than most active noise-isolating earbuds. The SE846-CL cable is also engineered to the highest degree. The cable is braided and coated in plastic for long lasting durability. If a cable isn’t your thing, then you also have the option of the Shure SE846-BT1, the wireless version of the SE846-CL. The SE846-BT1 is going to appeal more to the general consumer with a short cable which goes around the neck, perfect for working out. The SE846-BT1 features an 8-hour battery life and inline remote and microphone for hands-free calling. The best part about both of these models is the cable detaches from the earbuds. This means any part of the earbuds breaks, you can remove that single part, purchase a replacement and install it yourself. Essentially you could own the SE846-CL for the rest of your life and just replace any parts should they break, which isn’t very likely. Shure includes a 64-inch and 46-inch detachable cables with your SE846-CL noise isolating earphones. If you want the best noise-canceling earbuds on the market, then you the best product on the market is the Shure SE846-CL. No headphones come anywhere close to the audio quality of the SE846-CL. They’re in a class of their own. With this exceptional quality comes some high-quality parts and engineering which costs money. 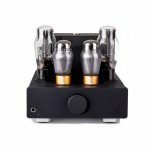 Both the SE846-CL and SE846-BT1 retail for $899 but are worth every penny. If you consider yourself an audiophile or always look for the best product available, these are the only earbuds you want to own. Just when you thought you’ve seen everything from noise-canceling earbuds, Sony comes up with the WI1000X Wireless noise-cancelling In-ear Headphones. 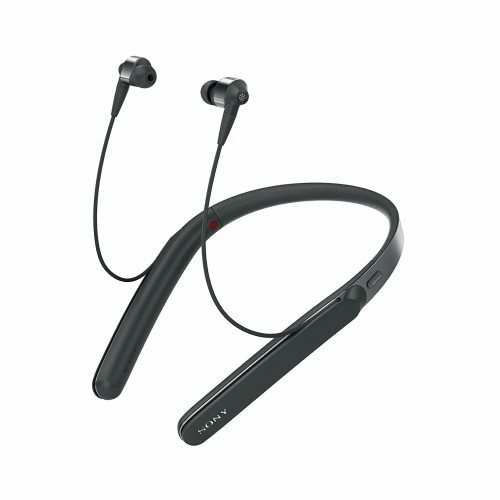 The Sony WI1000X is a neckband earbud headphone which means you’re somewhat limited to travel and general listening applications. The neckband bounces around when running or working out making the WI1000X not suitable for these sorts of activities. As travel earbuds, however, the WI1000X is an exceptional headphone with plenty of cool features and one of the most advanced headphone apps on the market. The WI1000X is the only noise-canceling earbud we found which allows for both cable and wireless use. This is especially useful when traveling because you use the WI1000X with in-flight entertainment systems and Sony even supplies you with a 2-pin adapter for this purpose. You can also use the cable with your smartphone and other audio devices with a standard ⅛-inch connector. On the inside of the left neckband is a small control panel with raised buttons so you can feel for the button you wish to use without looking. The buttons are also really well spaced to make it easier to tell the difference between each one. Buttons include play/pause/call management, volume up, volume down and power/Bluetooth pairing. The built-in microphone works really well for calls offering excellent sound quality for both you and the caller. You can also use the built-in mic for accessing Siri or Google for voice commands. 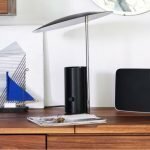 The WI1000X sounds slightly different depending on whether you use Bluetooth or the provided cable. For both cable and wireless, the bass response is nice and chunky with a decent punch. Not as bass heavy as Sony Extra Bass products, but definitely better than most noise-canceling earbuds. 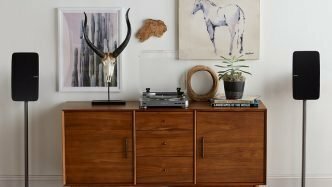 The mids and highs are also clear and present making both music and voice pleasant to listen to. When connected via the cable, the WI1000X sounds slightly cleaner and more refined which Sony refers to as High-Resolution Audio. It’s especially great for watching movies in-flight or on your mobile device. Where the Sony WI1000X takes things to another level is through the Adaptive Sound Control controlled through the WI1000X app. 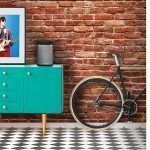 Adaptive Sound Control senses when you are walking, traveling or just standing still and will adjust noise-canceling, ambient microphones and volume to match your environment. All three of these settings are fully customizable on the WI1000X app where you can program and save these to match your preference. An unbelievable feature that makes the WI1000X truly standout from other noise-canceling earbuds. As well as noise-canceling the WI1000X features various ambient microphone settings. Useful if you’re walking through busy areas or need to stop for a conversation. The ambient microphones work really well and pick up more from what’s going on around you than you can hear without the WI1000X earbuds. The WI1000X has a 10-hour battery life when used as a wireless headset or 13 hours when using the cable with noise-canceling active. When the battery runs out, you can still use the WI1000X as normal cable earbuds without noise-canceling or the ambient microphone features. If you’re a fan of Sony products, then you’ll love the WI1000X Wireless noise-cancelling In-ear Headphones. 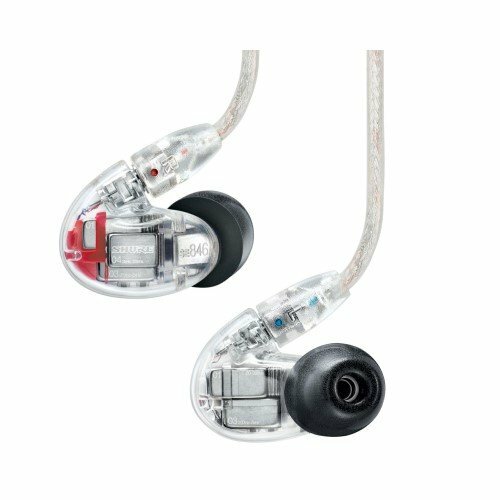 The sound profile is similar to the Extra Bass models but with less bass and slightly better clarity in the midrange and treble. What really makes the WI1000X is the Adaptive Sound Control and the ability to customize this feature via the app. This is a unique feature which actually adds value to your earbud experience rather than just a gimmicky extra. At under $230, the WI1000X isn’t cheap, but it’s definitely well worth the price. I know what you’re thinking. That was a lot to take in. Noise-canceling earbuds have evolved a lot with some awesome products available. Here are some recommendations based on the various applications you may want to use your noise-canceling earbuds for. If cost is your basis for choosing a pair of noise-canceling earbuds, then the Mpow Jaws will only set you back around $21. The Mpow Jaws features CVC6.0 noise canceling technology which is essentially passive noise-cancellation. If you want active noise-cancellation, then Audio-Technica ATH-ANC23 is a better option. These amazing active noise-canceling earbuds come in at under $40. An absolute steal for the quality you get from the ATH-ANC23. If you’re a bass head, then noise-canceling earbuds are always going to be a tough product for you. Let’s assume that the Shure SE846-CL automatically wins this and every category because they truly are superior. If the SE846-CL is out of your price range, then the Bose QuietComfort 20 and Sennheiser AMBEO both produce an excellent bass response. This is actually a really tough category because there are a few great noise-canceling earbuds for traveling so I’ve broken down according to two price categories. If you’ve got some money to spend, then the Bose QuietComfort 20 is an excellent choice. These earbuds were made for travel with exceptional active noise-cancellation. If your budget is only $100, I would highly recommend the Audio-Technica ATH-ANC23. These are such a great pair of no frills, just good quality earbuds. The ATH-ANC23 uses a AAA battery to power the noise-canceling which gives you up to 60 hours. Just crazy for a product that’s less than $40. You can purchase a set of rechargeable batteries and a charger and it’ll only cost a little over $50. The best noise-canceling earbuds for working out is the relatively unknown SGNL HB-N50. These lightweight earbuds deliver excellent sound quality and good active noise-cancellation technology. The HB-N50 also feature ambient microphones which allows you to go running or cycling and still need to be aware of your surroundings. The 9-hour built-in battery is enough to keep you going all day, more than enough for a full days use.